Very Rev Dr John Chalmers, convener of the World Mission Council, described it as a moving and unprecedented act of humbleness to appeal for peace and reconciliation in the troubled African country. Very Rev Dr John Chalmers greets Pope Francis. Vatican. 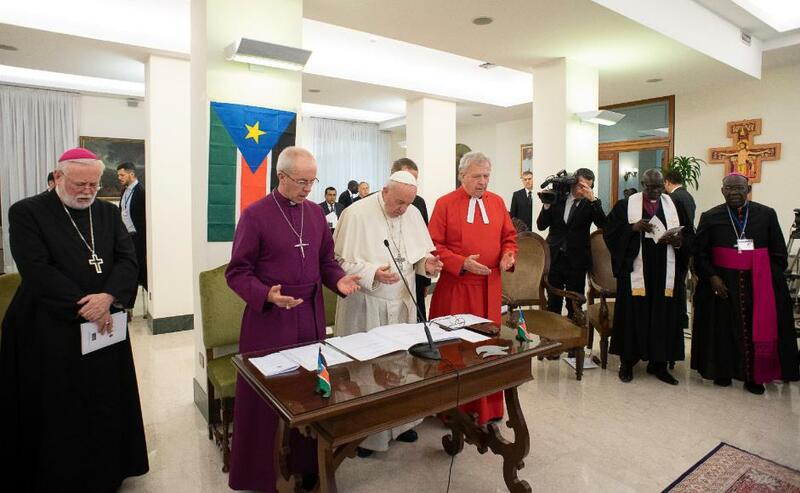 The former Moderator of the General Assembly attended a two-day spiritual retreat at the Vatican in Rome last week along with Pope Francis, the Archbishop of Canterbury, Most Rev Justin Welby, and South Sudan church leaders. 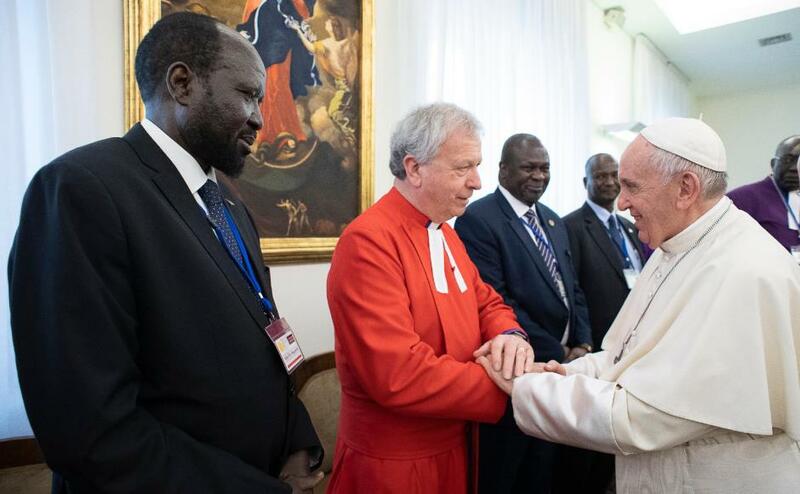 It brought together President Salva Kiir, his three vice-presidents including opposition head Riek Machar, all of whom had their feet kissed by the Pope who usually never shows such deference to politicians. The youngest nation on earth, South Sudan gained independence from Sudan in 2011 and the country was plunged into a bloody civil war two years later. At least 400,000 lives have been lost to date, more than four million people are displaced from their homes and nearly eight million are in need of humanitarian assistance. Pope Francis appealed to the politicians to respect an armistice they signed and commit to forming a unity government next month. Speaking during Holy Week, Dr Chalmers said the expectations for cooperation towards peace and reconciliation were “exceeded beyond measure”. He added that the presence of leaders from the Presbyterian, Roman Catholic and Anglican churches, who came together in this context for the first time, led to frank and honest conversations. Praying for peace. Archbishop of Canterbury, Most Rev Justin Welby, Very Rev Dr John Chalmers and Pope Francis. Vatican. Dr Chalmers said: “There was clear acknowledgment from the political leaders that there was blame on all sides for the breakdown of relationships and they have much to do to recreate the atmosphere needed for peace. Dr Chalmers said the politicians all belonged to one of the three Christian denominations. “This meant an awful lot to them and helped them start to say very honest things to one another to try and begin to put the past behind them and think about a more positive future,” he added. The Church of Scotland has a partnership with the Presbyterian Church of South Sudan. Dr Chalmers’ determination to help try and bring lasting peace to the country stems from his visit there in 2015 when he was Moderator of the General Assembly. Since then, the Kirk has worked hard to affect lasting change and has held multiple peace and reconciliation training sessions for South Sudan church leaders in Scotland, in Kenya and in South Sudan with further plans for work in the future. 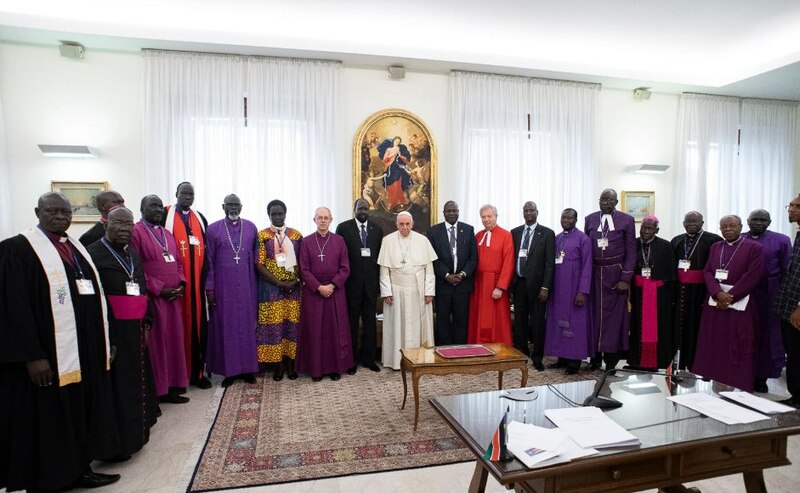 The Spiritual Retreat in Rome brought together politicians and faith leaders from South Sudan with the Roman Catholic Church, Anglican Church and Presbyterian Church. Vatican. On May 12th, opposition leader Machar is expected to return to South Sudan and once again serve as Kiir’s deputy. Pope Francis told those gathered at the retreat that he shall never tire of repeating that peace is possible. He described peace as a “great gift of God but it was a supreme duty on the part of those with responsibility for the people”. Pope Francis said: “All of us are called to be peacemakers, to build peace through dialogue, negotiation and forgiveness. “People are exhausted by conflicts. “Remember that with war, all is lost”.